They might have been far and few between in the past, but choice-based games are now becoming a prevalent gaming genre. Described as a “point-and-click thriller”, Gods Will Be Watching is set across six chapters, and is a minimalistic foray asking you to set aside your morals in order to solve a series of puzzles. Based on a mini-game created for a Ludum Dare 26 challenge, Gods Will Be Watching was an intriguing game, if nothing else. 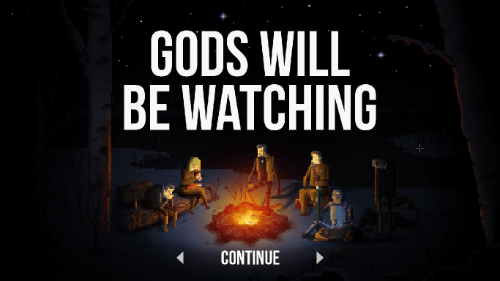 Gods Will Be Watching is initially quite frustrating. There is a lack of instruction and objectives, and the first chapter seems to introduce players to a new level of thinking, rather than any story or gameplay elements. It’s because of this that it’s easy to find yourself at the game over screen fairly often. Once you’ve seen it once, you should become accustomed to it because you’ll be seeing it quite regularly. Read the rest of my review on Filmoria.